As lawmakers discuss the possible impeachment of one or more West Virginia Supreme Court Justices, the rarity of the process raises questions about procedure, its history and other potential constitutional issues. The resolution calls for an investigation of the potential impeachment of one or more West Virginia Supreme Court justices and cites Article IV, Section 9 of the state Constitution. During meetings in the run-up to last week’s special session, legislators noted a lack of clear definitions for some of these potentially impeachable offenses. West Virginia University College of Law professor Bob Bastress said that the language is meant to allow for a separation of powers between branches of government. He said impeachable offenses in West Virginia are written much more broadly than those on the federal level. “If you have very vague terms, and they're pretty broad -- it can be used by the Legislature to intimidate the executive [or judicial branches] and that's why the feds rejected it and instead used ‘bribery, treason and other other high crimes and misdemeanors,’ which is much [more narrow],” he explained. West Virginia University Constitutional Law professor Bob Bastress. But, as Bastress notes, there are only a few cases in West Virginia’s history where the Legislature has exercised its power of impeachment. Bastress -- who is married to Democratic Del. Barbara Fleischauer -- is recognized as a leading scholar on West Virginia Constitutional law. Fleischauer serves as minority chair of the House Judiciary Committee, the group of delegates tasked with investigating potential impeachments. The ambiguity in what counts as an impeachable offense is just one aspect of what makes the potential impeachment of one more justices especially notable. If a public official is believed to have committed an impeachable offense, the House of Delegates has the sole power to bring forth an impeachment. Delegates on the House Judiciary Committee would establish procedure, gather evidence and -- if an impeachable offense is determined to have occurred -- draw up articles of impeachment. If those articles are approved by the entire House, a trial would take place in the Senate to determine if the individual is to be removed from office. A two-thirds majority in the Senate is required for a conviction and removal from office. This has happened only one time in West Virginia’s 155 year history. In 1875, Treasurer John Burdette was accused of using his office for private gain by taking money from banks that stored state funds. The auditor, Edward Bennett, was accused of failing to file paperwork that would have brought Burdette’s behavior to light. Both men were impeached. However, Burdette was the only one to be tried and convicted. Bennett was tried, but was acquitted of the charges against him. In 1926, Auditor John C. Bond was impeached by the House -- but resigned in advance of a trial in the Senate. Bond was accused of writing state checks to friends and family members. The last impeachment proceedings came in 1989 against then-Treasurer A. James Manchin for his role in losing nearly $300 million in state funds to bad investments. Manchin also resigned in advance of a trial in the Senate. Other proceedings have also taken place where state officials were investigated by the House but never impeached by the full chamber and -- in other instances -- where officials were investigated and never charged. That said, Burdette’s case in 1875 stands as the only time a West Virginia state official was impeached, tried, convicted and removed from office. Reports surfaced late last year detailing lavish spending by the court on office renovations. Justice Allen Loughry — who was Chief Justice at the time — came under fire for the high-dollar cost to taxpayers. Included in that spending was a $32,000 couch and other office renovations totaling more than $3.7 million. Loughry also is said to removed a historic desk — one selected by architect Cass Gilbert to be used in the West Virginia Supreme Court offices in the 1920s — from a warehouse and placed it in his private home. Loughry later returned the desk. During the 2018 legislative session, Del. Mike Pushkin called for Loughry’s impeachment. “He has taken no responsibility, no accountability for what's gone under his watch and in his office and in his home while he has been Chief Justice of the Supreme Court," Pushkin said while offering a resolution to investigate impeachment on Jan. 11, 2018. Efforts for impeachment were largely ignored -- and sometimes criticized -- until official reports came from the Legislative Auditor’s office. Del. Mike Pushkin announces plans on Jan. 11, 2018 for a resolution to investigate impeachment against then-Chief Justice Allen Loughry. Audits released later found that Loughry used state resources, including vehicles and computers for private use. 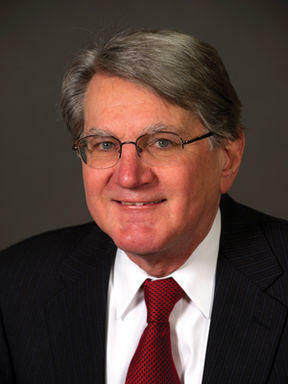 Justice Menis Ketchum was named in one of the audits for allegedly misusing state vehicles. Following those audits, Ketchum reimbursed the state more than $1,000 for trips investigators found were for personal use. In a statement of charges filed Wednesday, June 6, the state court system’s Judicial Investigations Commission found Loughry abused the prestige of his office. He is also accused of lying to the media, lawmakers and the public about his knowledge of high-cost renovations to the Supreme Court offices and improper use of state resources, including furniture and vehicles. Loughry was subsequently suspended without pay. Weeks later, Loughry was indicted on 22 counts of federal charges, including fraud, witness tampering and making false statements. He has pleaded not guilty to those charges. Following charges from the JIC and federal prosecutors, lawmakers from both parties and Gov. Jim Justice have called for Loughry’s resignation. As delegates prepared to adopt House Resolution 201 and formally move forward with an investigation of Supreme Court Justices for possible impeachment, Democrats in the House offered an amendment that would have set deadlines for the respective proceedings in the House and Senate. The amendment, sponsored by Del. Isaac Sponaugle and other Democrats, would have forced the House Judiciary Committee to submit final recommendations for impeachment to the full body on or before July 23. Del. Isaac Sponaugle and other Democrats offered an amendment that would have set a deadline for the House Judiciary Committee to offer a recommendation for impeachment of one or more Supreme Court justices. 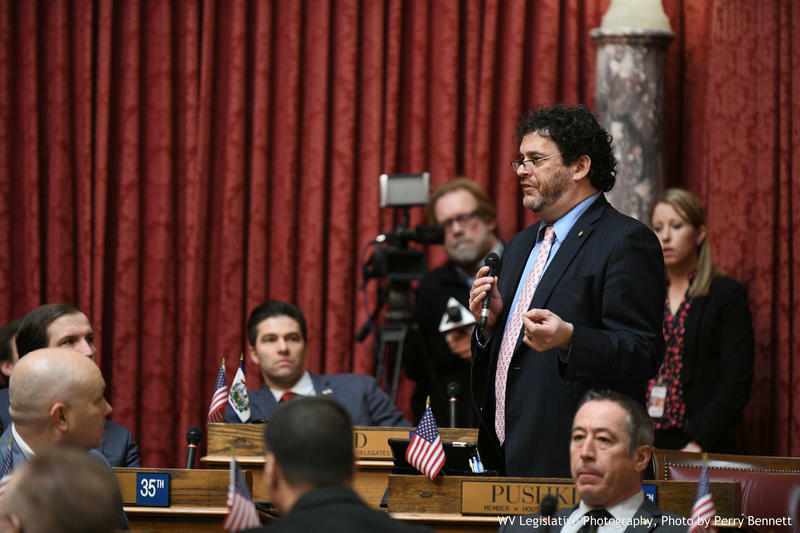 “The issue on this amendment is, frankly: Should the voters of the state of West Virginia have a right to vote on who their justices are going to be for this court or should the governor had the important power for two years?” Sponaugle asked on the House floor when presenting the amendment. Republicans countered by arguing that there is few cases of impeachment precedent and that carefulness is the path forward. The amendment offered by Democrats ultimately failed on a, 32-57 vote along party lines. House Judiciary Chair John Shott argues against setting a deadline for the impeachment process. What’s behind Sponaugle and the Democrats’ failed amendment centers around how a vacancy would be filled and how long an appointee would serve on a bench before a permanent replacement would be had through a special election. According to various sections of state code, a vacancy in the Supreme Court -- for any reason -- would result in an appointment by the governor. However, the date of the vacancy matters -- and how long an appointee would be in place before a special election occurred. If a vacancy would happen before August 14, 2018, a special election for the open seat on the bench would take place as part of the November 6, 2018 general election. If the vacancy would take place after August 14, 2018, a special election would take place in May 2020. The August 14 date comes from provisions throughout Chapter 3, Section 10 of West Virginia State Code, which states that if a vacancy comes on or before 84 days before a general election, a special election would take place in November. Bastress said any person holding a seat in public office -- whether appointed or elected outright -- can often be seen as holding an advantage. The longer that person would hold office as an appointee before a special election, the better the advantage, he said. “Being appointed is a leg up on reelection,” said Bastress. But Bastress said attempts to expedite the process are politically motivated and the process -- including a trial in the Senate -- could take months on end. “An impeachment is not something you can rush,” he said. Loughry’s 12-year term ends in 2024. If he were impeached and removed from office, the person holding that seat after a special election would then be up for reelection at the end of the term. House Speaker Tim Armstead steps down from the podium and requests to be recused from matters relating to impeachment of one or more Supreme Court justices. Spearker Pro Tempore John Overington ruled Armstead would have to vote on the matter. Follow that committee’s meeting on Monday, June 25, Carmichael and Speaker Pro Tempore John Overington issued a letter to Gov. Jim Justice asking him to call a special session on possible impeachments of Supreme Court justices. Almost simultaneously, Armstead issued a statement attempting to remove himself from any perceived conflict of interest. “When I announced I would not seek re-election to the House of Delegates, I also indicated that I am considering the possibility of seeking a statewide office in 2020. One office I indicated I am considering running for is a seat on the West Virginia Supreme Court of Appeals,” Armstead said in the statement. Armstead went on to say he didn’t believe there was an actual conflict of interest, but it was best to request a ruling on the matter. At the beginning of the Tuesday, June 26 special session, Armstead stepped down from the Speaker’s podium and, after handing over his duties to Speaker Pro Tempore John Overington, formally requested to be recused from matters relating to the possible impeachment of Supreme Court Justices. Overington ultimately ruled Armstead would take part in the impeachment proceedings. Overington noted that Armstead, at the time of his request for recusal, had not filed pre-candidacy paperwork to run for a seat on the court. A Constitutional Complication: Who Will Preside Over a Trial in the Senate? While some aspects of impeachment procedure are vague, the West Virginia constitution states that the Chief Justice of the West Virginia Supreme Court would act as the presiding officer over the Senate during an impeachment trial. “When sitting as a court of impeachment, the president of the supreme court of appeals, or, if from any cause it be improper for him to act, then any other judge of that court, to be designated by it, shall preside; and the senators shall be on oath or affirmation, to do justice according to law and evidence,” states Article IV, Section 9 of the West Virginia Constitution. But with Chief Justice Margaret Workman -- and all of the other justices -- named in House Resolution 201, it begs the question as to who would serve as the presiding officer. Bastress said it could wind up in the hands of a former Supreme Court justice, but legislators would not be able to influcence that decision. “The constitution's pretty strong [in that] the Legislature cannot dictate procedures to the judiciary,” he explained. 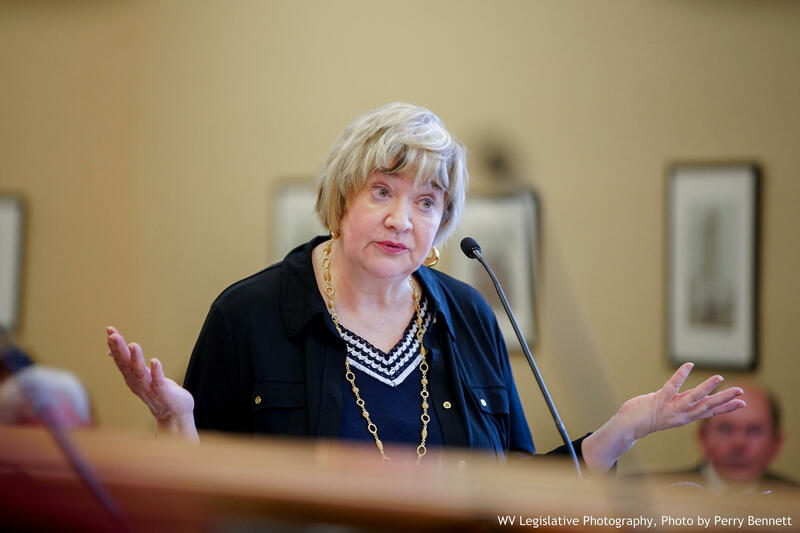 West Virginia Supreme Court of Appeals Chief Justice Margaret Workman addresses the Legislature's Post Audits Subcommittee on May 20, 2018. Following the Judicial Investigation Commission statement of charges against Loughry, Workman and the other justices recused themselves from matters related to the embroiled justice. Kanawha County Circuit Judge Joanna Tabit was appointed to serve as chief justice in matters related to Loughry. But the state Constitution doesn't explicitly allow her to preside over the Senate if it holds an impeachment trial. Bastress said he isn’t sure that Workman and the other justices' inclusion in House Resolution 201 is a clear instance that would preclude them from presiding over a trial in the Senate -- namely because articles of impeachment have yet to be voted on in the House. He also said he doubts Workman’s original order appointing Tabit to preside over the case involving Loughry would apply in matters of impeachment and that another order may be needed. Bastress said Loughry or any other justice who may be impeached could argue that the process was procedurally flawed -- should anyone other than one of the five elected justices preside over the trial. “He could be tried by a presiding officer who's not a sitting justice -- and he could make the argument that it's not consistent with [the Constitution],” Bastress explained. However, Bastress pointed to precedent where a district court judge in Mississippi appealed a federal impeachment on procedural and constitutional grounds, but it was ultimately never heard in a higher court. Requests for comment from the West Virginia Supreme Court of Appeals regarding who would be the presiding officer in the Senate went unanswered as of Friday afternoon. 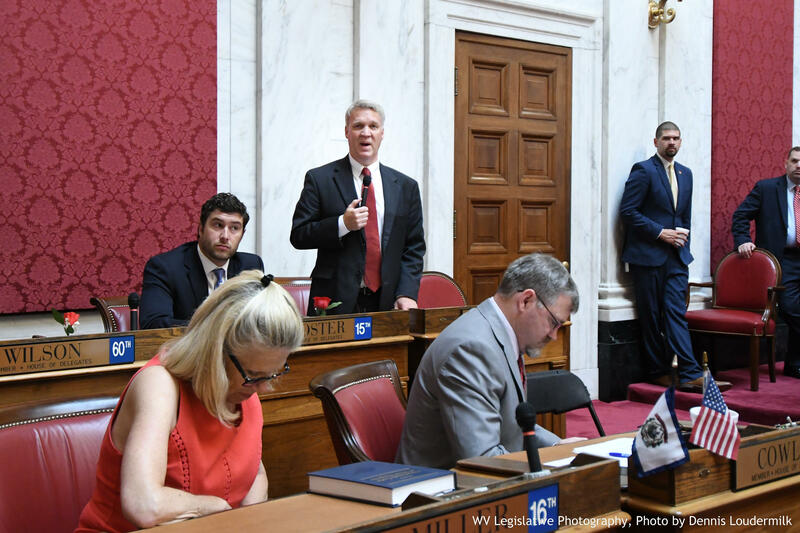 Following the passage of House Resolution 201, delegates on the House Judiciary Committee gathered on Tuesday, June 26 for a presentation on the history of impeachments in West Virginia and an explanation of the procedure. A notebook of information was distributed to committee members outlining this history, as well as potential evidence that may be used in drafting articles of impeachment. These materials also included two reports from the legislative auditor regarding the Supreme Court, the Judicial Investigations Commission statement of charges against Loughry and a federal indictment against him. Delegates on the committee are now set to establish procedure, including what evidence can and will be considered and decide whether certain legal rights such as due process are appropriate in an impeachment. Democrats on the committee have said due process isn’t applicable in cases of removing an elected official from their position. “This is not a due process argument -- this is about public office. There is no life, liberty or property issue,” said Del. Shawn Fluharty, a Democrat who sits on the House Judiciary Committee. “Public office is a revocable position that belongs to the people of West Virginia -- and, if a impeachable offense occurs, we have a duty to remove an office holder and restore the power to the people of West Virginia to elect a new person,” Fluharty added. Del. Shawn Fluharty sits in the House Judiciary meeting on June 26, 2018. On Thursday, the House Judiciary Committee announced additional meetings. Those meetings will take place Thursday, July 12 through Saturday, July 14. The committee will then recess to organize additional witnesses and gather further evidence and then reconvene the following week for another three days -- beginning Thursday, July 19. In addition to Shott, the legislative managers include committee vice chairman Roger Hanshaw and Ray Hollen -- both Republicans -- and Democrats Andrew Byrd and Rodney Miller. “I am confident that we can proceed in an impartial and non-partisan manner commensurate with the seriousness of the assignment entrusted to us,” Chairman Shott said in a written statement announcing the upcoming meetings.